A shared mailbox, as the name implies, is a mailbox that multiple users can access to send and receive emails. A shared mailbox is very handy, as it allows multiple people to answer customer queries, which will be sent to a common email address. But, of course, if multiple people have access to one mailbox, it's necessary to keep tabs on who accesses it and when to keep your Office 365 environment secure. Gives an overview of all the shared mailboxes in the Office 365 environment, with details like display name, object ID, alias, and more so you can decide whether to add or delete shared mailboxes. 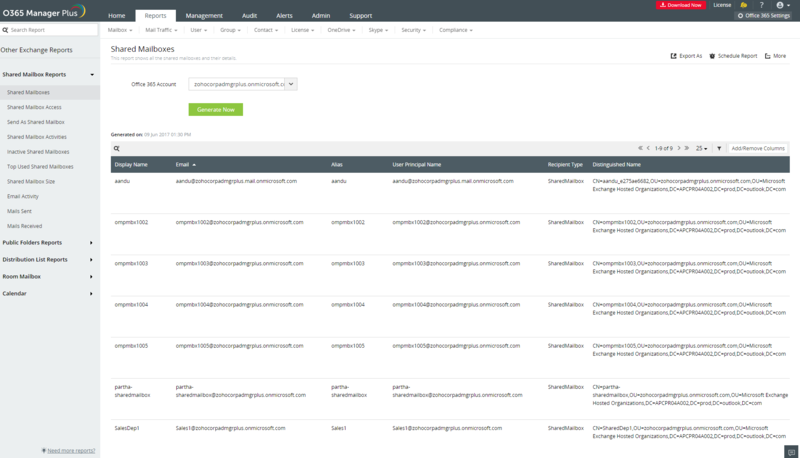 Provides the audit trail of user activities across all the shared mailboxes, with details like, who accessed the mailbox, the owner of the mailbox, when the mailbox was accessed, the operation performed, and more. Users with the send-as right can send emails from another email and make it look like the email was sent from the shared mailbox. 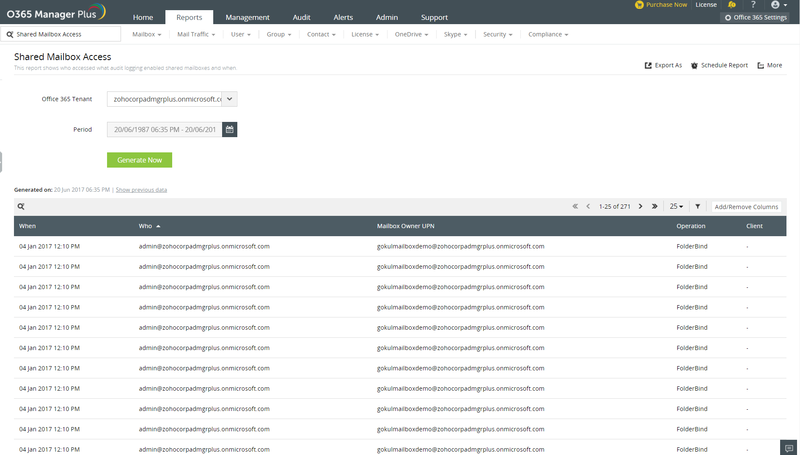 This report from O365 Manager Plus shows which users have used this right, when they used it, the client IP address, and more, in the specified duration. 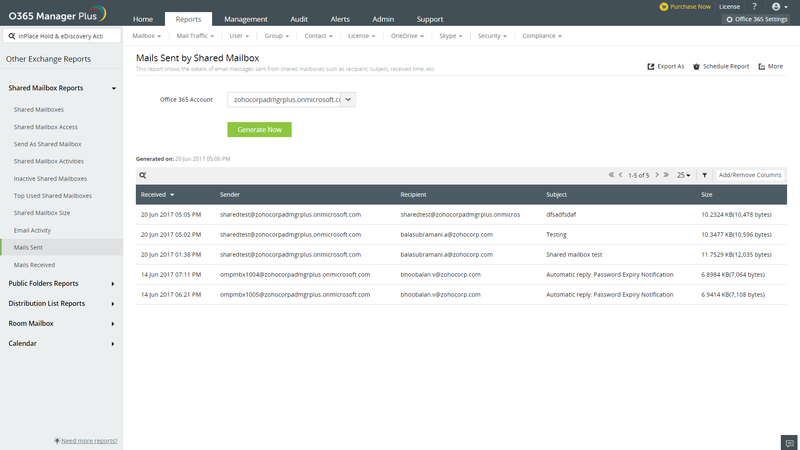 Gives the complete audit trail of user activities on shared mailboxes in Exchange Online, with details on users who accessed the shared mailbox, the operations performed, the time of the operations, the operation statuses, and more. 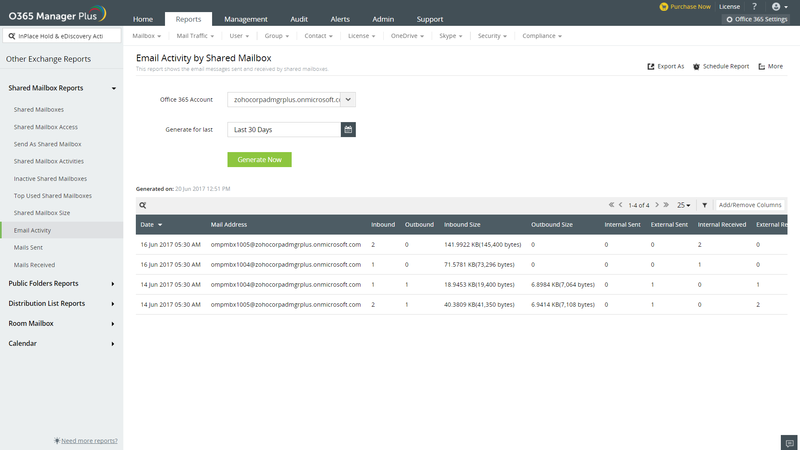 Shows which shared mailboxes have not been used to send or receive emails in the specified duration. 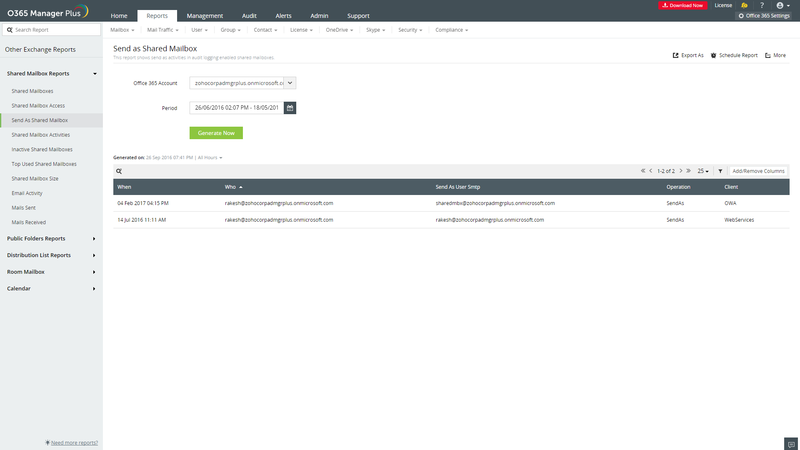 This helps the administrators to identify and remove inactive mailboxes in Exchange Online environment. 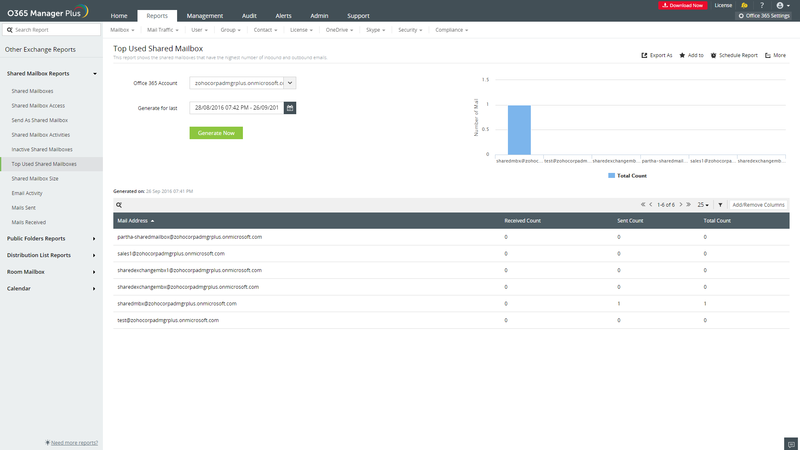 Gives details about the shared mailboxes that have the maximum number of inbound and outbound emails. 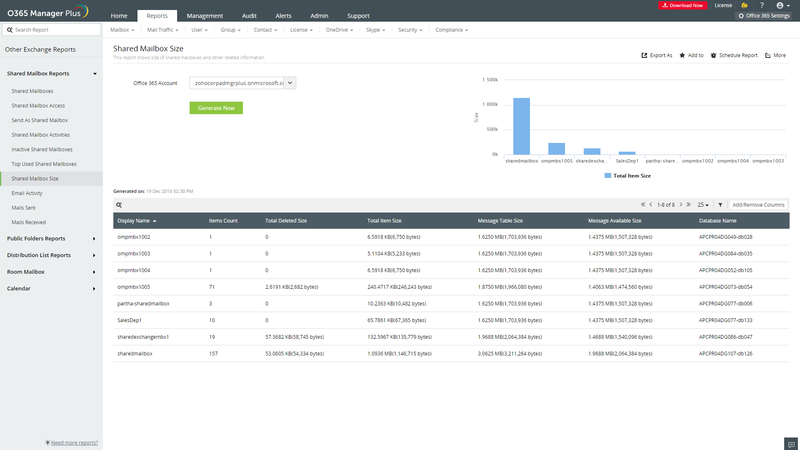 It provides their email addresses with their respective received email count, sent email count, and total email count for a specified duration. Gives insight on shared mailbox usage, with details on the number of items in the shared mailboxes, the size of those items, the message table size, the total deleted size, and more. This report gives a summary of the email activities of shared mailboxes. It provides details on email sent and received and the respective sizes on a per user per day basis. 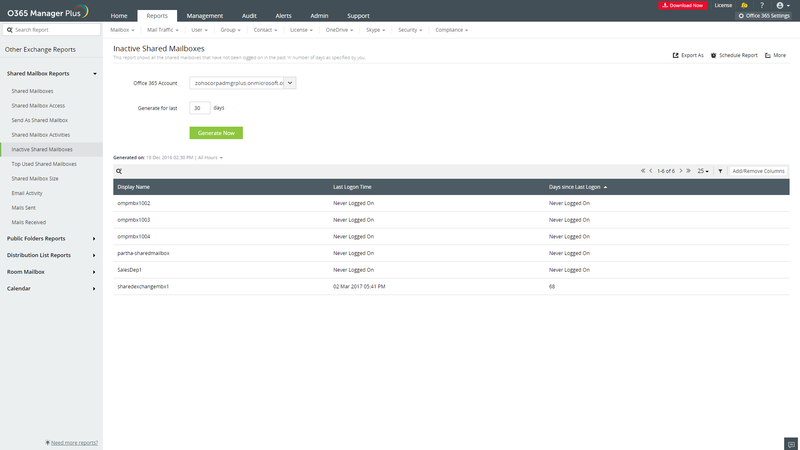 Gives details about emails sent by the shared mailboxes with details like the receiver's email address, subject of the email, size of the email, when was it sent and more, which helps to keep tab on emails sent from the shared mailboxes. Gives details about the emails received by the shared mailboxes. It shows the sender's email address, the subject of the email, the size of the e mail, when was it received, and more, which helps to keep the email received by the shared mailboxes in check.